So you are trying to decide whether to buy the Nespresso CitiZ or the newer Nespresso Essenza Mini by either Breville or De’Longhi. It’s a hard decision even for me. 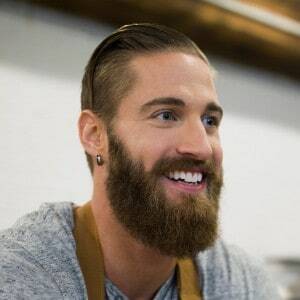 You see, I own both machines and I have brewed hundreds of capsules in each of them. If I were told I had to get rid of one of them I’m not sure which one I would choose to keep! Both models are very similar. It’s obviously confusing for customers to immediately see the differences between the machines (aside from the price tag) but let me try anyway to explain the differences and help you choose the better one to buy. I hope that this article helps you make your decision. I like to cover similarities first because if both devices were substantially similar then pricing would be the only obvious distinction to make. In this case there are a handful of things that are identical to both devices… meaning, these features should have no bearing on which Nespresso model you ultimately decide to buy since they exist in both. First of all, both units brew the exact same espresso shots from the exact same capsules in roughly same amount of time. Both brew with the same 19 bars of pressure using a pump mechanism. Both the CitiZ and Essanza Mini are made by either Breville or De’Longhi and they both have the same warantee. 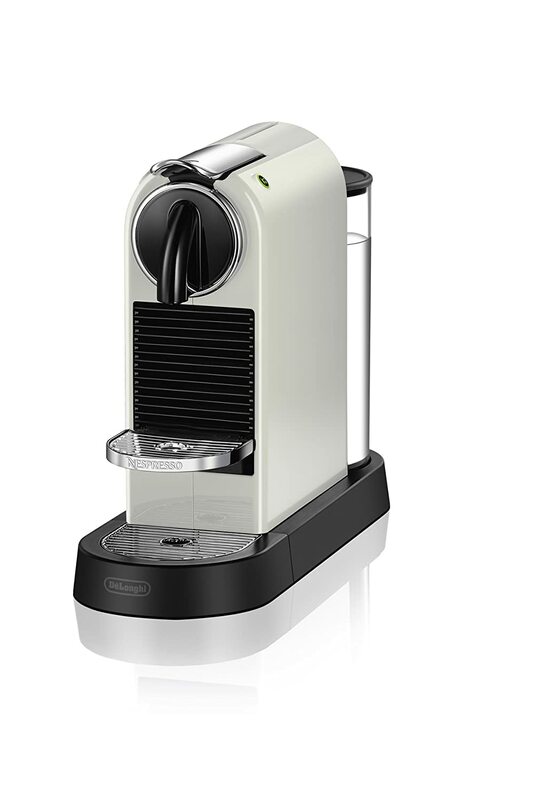 Lastly, both units can make either espresso or lungo shots with two dedicated buttons. Neither machine really does anything else (like froth milk or make mixed drinks). Both machines however, give you the ability to re-program each dedicated button to brew the size of shot you prefer. For me I like my espresso shots to be closer to 2-ounces in size and my lungo shots to be closer to 4-ounces in size, kind of like a long black or an Americano. Considering these features are the same in both machines we can essentially throw this information out and not think of it again. This leaves us with only their differences. Because I have used both models hundreds of times I can tell you confidently that there are a few good reasons why you would want to choose one over the other. Let’s look at their main points of differentiation. For me, I tend to use the Essenza Mini more often because it is quieter. In my home I have small children who are asleep in the morning and I don’t want to wake them up so the 7-10 decibels makes a difference to me. I really can’t tell a difference in brew time or heat up time between the two but if I want the baby to stay asleep in the morning or at nap time I use the Essenza Mini to brew my espresso every time over the CitiZ. Later in the day however I almost always use the CitiZ because it makes espresso just as good but I don’t have to refill the water reservoir or empty the spent capsule chamber as often. It’s amazing that this is important to me but the extra size of the CitiZ is a big benefit because (although these maintenance necessities are easy) they are simply annoying! The CitiZ is also made from a more sturdy and heavy-duty aluminum housing compared to the plastic casing that surrounds the Essenza machines. The heft doesn’t come into play very often for me but occasionally I accidentally move or bump the machine while adding water and the CitiZ never seems to move around or tip over as much… this means I have fewer (and less messy) spills compared to the Essenza Mini. Of course if you really do have tight space in your kitchen then the Essenza Mini will be better. Likewise, if you don’t brew very many capsules then the Essenza Mini will also be better because you do still need to clean out the drip tray and spent capsule container regularly before bacteria growth can lead to mold. Yes, this is a problem if you don’t empty and clean these trays often enough. For people that only brew a capsule once every one or two days then the smaller Essenza Mini may be the more sanitary option. Last main difference is the most obvious – pricing. The Essenza Mini is significantly cheaper than the CitiZ so if you are price sensitive (even a little bit) and the above pros for the CitiZ aren’t that compelling to you then you should absolutely go for the Essenza Mini based on pricing alone. You can see pricing for the Essenza Mini right here compared to pricing for the CitiZ right here. Keep in mind that despite the price difference the CitiZ is still easily on the low end of the pricing scale for Nespresso machines because it doesn’t have any of the premium features found in machines like the Nespresso Expert, Lattisima, or Vertuo line of machines. Which One Do I Think is Better? Obviously the main differences between these two machines are not just looks; both machines are different in subtle ways that may not even matter to all people. I feel like the only main reason why I like the CitiZ over the Essenza is that it’s bigger. It holds more water, holds more spent capsules, and seems a little sturdier on my counter… that’s why it costs a little bit more but the question of the hour is is the extra cost worth it? For starters I’d like to say that I normally advise just about everybody to opt for the Essenza Mini over all the other Nespresso machines. It is priced lower and makes espresso shots just as good as the most expensive models in their line. As far as operations is concerned the Essenza Mini is the best value in the Nespresso line hands down – you can see current pricing for the Essenza Mini on Amazon here. There are reasons however that you may want to trade up the the CitiZ so if you have slightly deeper pockets then read on to see if it’s worth it to you. Lets now look at each machine individually. The Nespresso CitiZ Espresso Machine from the De’Longhi line of products is one of the most sought after models when it comes to Nespresso. In fact, this model is by far one of those models that have become the face of the De’Longhi Nespresso makers. This machine comes with a fairly large water tank- a one of 34 ounces, to be more specific. This large size ensures that you would be able to prepare more Espresso before you have to refill your machine, making it a great choice if you plan to make a lot of Espresso! The folding drip tray accommodates larger cup sizes, and drops down automatically when you remove your mug to catch drips and that’s just perfect because that means you don’t have to go through the hassle of having to cleaning up the countertop or table after every use. Again, with the adjustable cup size and the choice between Espresso and Lungo, this model retains the level of functionality and versatility you’d expect from a good upper-range Espresso Machine! The pressure of the pump that this machine is equipped with is 19 bars, which is pretty much the standard and so is something you really do not have to be concerned about if you’re not looking for something specifically different. Again, this model is available in several color choices that you can choose from when you decide to buy the model. This model offers you colors such as Black, Red, Silver and White to give your counter-top as well as your overall kitchen the perfect look that it deserves. This actually goes a long way in the aesthetic aspect of this product, and is something you must consider. This machine, as far as the financial aspect is concerned, is an upper range model, and as such, you must be aware about the price before you decide to go for this model. You must ensure that it’s within your budget before you jump into it, because that’s what a smart shopper does! You can see more specific information on the CitiZ on our review page or check current pricing here. The Nespresso Essenza Mini Espresso Machine from the Breville line if products is yet another product that is really loved in the market. This model is known for its economic aspect and how it provides you with a lot of functions despite having a pretty affordable price. The main features of this model might be discussed now. This machine also lets you prepare both Lungo and Espresso, giving you the standard level of versatility. This machine boasts of the special Centrifusion technology that ensures that all the coffee is properly extracted, giving you the perfect flavor and aroma, making your drinking experience absolutely perfect. This is something that this machine is really loved for, and so is something you might want to keep in your mind. 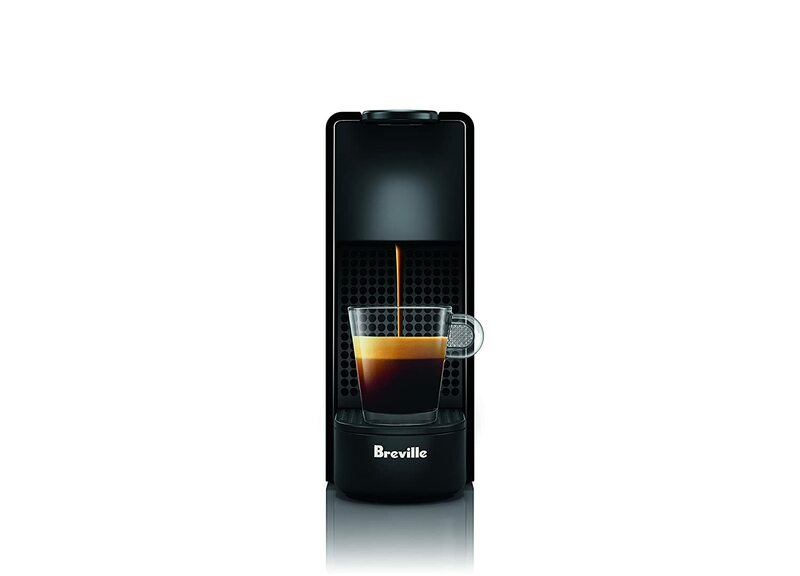 In this aspect, this machine is just like the Nespresso Vertuo Coffee and Espresso Machine by Breville. Next in line is the fact that this model also boasts of a Eco mode for low Energy consumption after 3 minutes and an automatic energy-saving function that serves to switch machine off after 9 minutes of inactivity. And, as we remarked earlier, this model is actually a pretty affordable model. While it might not be the least priced model out there, it’s still a really affordable one that you might easily be able to go for! Click through to see our full review of the Essenza Mini or check current pricing here. These two machines are fairly different upon close inspection. Firstly, the CitiZ provides you with a comparatively larger tank, making it a better choice for you if you’re planning to make more Espresso. Next, the CitiZ comes with a beautiful folding tray that has been reported by users to be really useful. This is not present in case of the Essenza Mini, and is something you might want to keep in mind. The CitiZ also boasts of several colors, this is not something that the Essenza Mini is able to offer you with. So, if you’re one of those people that love the aesthetic aspect too, the CitiZ might just be the better choice for you here. The Essenza Mini, on the other hand, provides you with a quieter pump that the CitiZ cannot boast of, and it actually does a pretty good job of extracting the flavor, just as good in fact! So, if you want that, you might want to slide with the Essenza. Finally, from a financial perspective, the Essenza is clearly the better option of the two here because of its comparative advantages given its lower price. So, if you’re looking to be a smart shopper here, the Essenza might be the right choice. The CitiZ is going to be better for people that don’t like filling water reservoirs as often, don’t like emptying spent capsule containers as often, and have a few extra bucks to spend. For most people however the extra cost is not worth it. You can see current pricing of the CitiZ on Amazon here and compare it to pricing on the Essenza Mini here. We advise the Essenza Mini. Finally, we can conclude by saying that both the machines are really great machines and you might really go for any of them and you would love it. However, given the price difference, the Essenza seems to be a good choice nonetheless. But of course, if you love the CitiZ for any reason, then that is always the right one for you. Please keep in mind that the right model for you isn’t the most logical choice, but the one that actually serves all your needs and wants at the most affordable price! Once you know what you are looking for, it becomes surprisingly easy to judge models based on your needs. And your specific needs guide you towards the model that is perfect for you. Once again, know that the bestselling model isn’t always importantly the best one for you. The best model for you is the model that serves all your needs at the most affordable price. Gamble Bay Coffee is here for you and we always strive to help you out. If you have any queries, feel free to reach out to us and we will try our best to help you in any way we can. Hope to see you again on our next article!